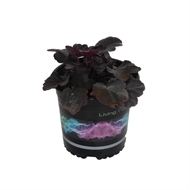 Shiny, black rounded leaves with a distinctive clumped form. Small, bell-shaped flowers appear in early summer. Great for containers, mixed beds and for mass effect. Will tolerate more sun then lighter varieties.